Union Ridge Cemetery was founded in 1838. It is Chicago's oldest existing cemetery. 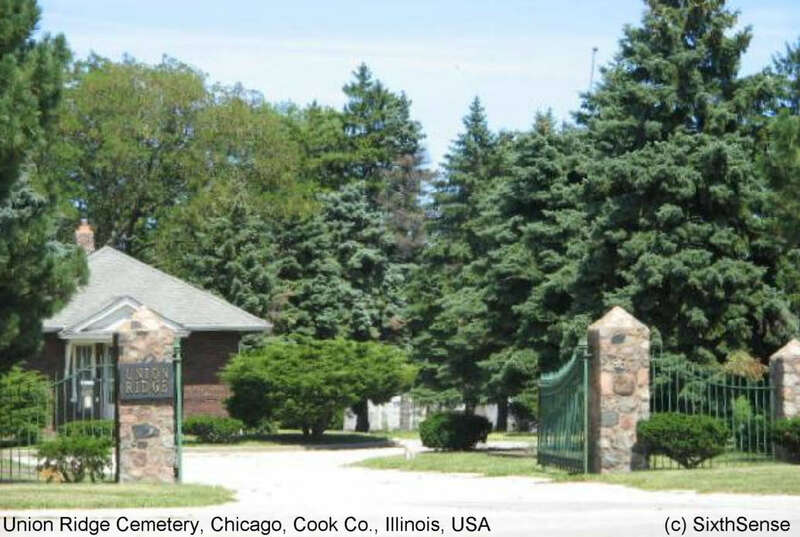 Originally located in Norwood Park Township (annexed to the city of Chicago in 1893), the cemetery was founded by resident farmers of the area. Henry Smith, an early Cook County settler, donated a small corner of his land to serve as the cemetery. Smith died in 1841, and was the first person to be buried in the cemetery. The cemetery originally did not have an official name; it was referred to merely as "The Cemetery" or "Smith's Ridge". After the Civil War, about 67 veterans were buried there, and it came to be known as "Union Ridge Cemetery". Today, the cemetery has a special section featuring a cannon, dedicated to Civil War veterans. In 1904, another cemetery was founded just to the south of the original Union Ridge Cemetery, and was called "Norwood Park Cemetery". It was eventually purchased by the Union Ridge Cemetery Association, and the two cemeteries merged in 1913. In 1912, Union Ridge's original wooden office/chapel building was destroyed in a fire, along with the cemetery's earliest records. It was replaced in 1916 by a brick office and chapel building, which remains today.